Lately, I've been cooking a lot of soups to take to work for lunch. I put individual portions in Tupperware containers (the screw top ones that are made for liquids) and freeze them. That way, I can take them to work straight from the freezer and microwave it later in the day. 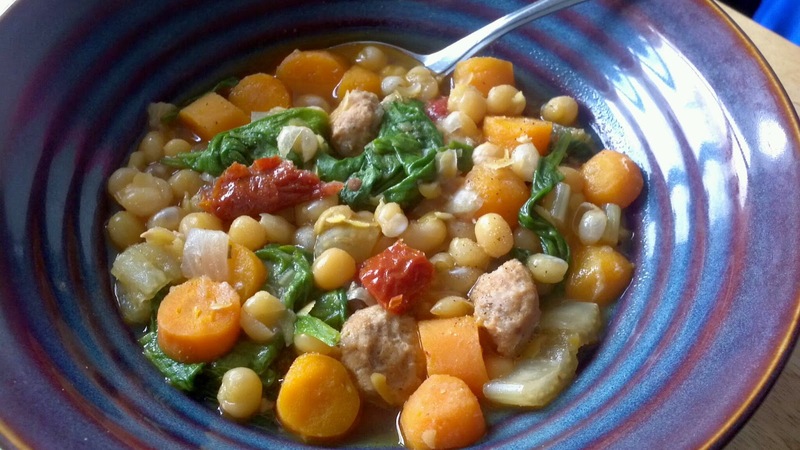 This soup is high fibre and high protein, so it makes a great post workout meal. The spinach in this recipe can be swapped for any of your favourite greens, such as kale or dandelion greens. Layer all the ingredients (except spinach) in the slow cooker pot in the order listed. Cook for 4 hours on high. When there is 5 minutes remaining on the cooking time, remove lid and take out bay leaf and add in spinach. Replace lid. Spinach will wilt. When the cooking time is finished, stir soup to mix all ingredients together.